Finally got through the original trilogy and got a chance to pop in and see the newest X-MEN. The hype has been good on this one, and I can’t fully blame others. I got a chance to see the opening battle sequence at a conference last month and my radar was definitely up for this one. This may be a couple weeks late in terms of new releases, but this is about as current as I get these days. I blame my children. 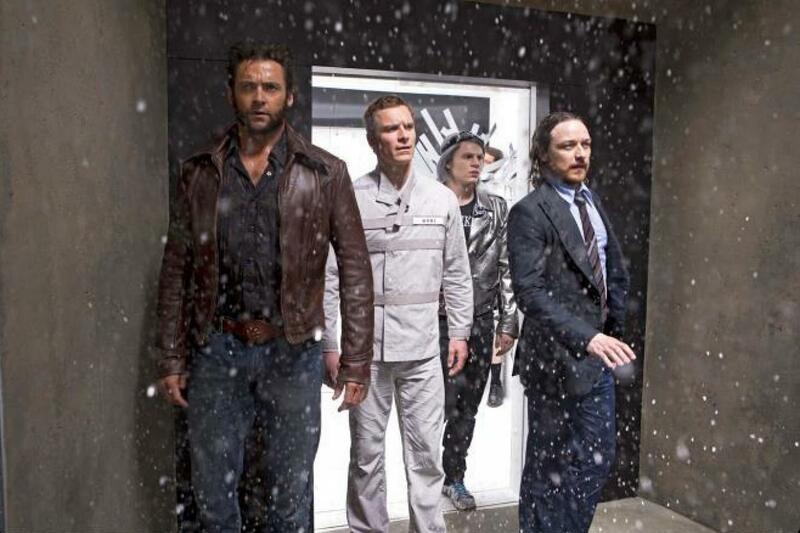 I watched X-MEN: DAYS OF FUTURE PAST (2014) in theaters on 6.3.14. It was my first viewing of the film. Time travel is always a tricky proposition. JJ Abrams used it smartly in rebooting STAR TREK, but the use of time travel often leads to a frustrating wash of all that has come before. X-MEN is in an odd place. The original trilogy was excellent up until the third one was decimated by Brett Ratner. So the director of the first two, Bryan Singer, comes back on board to clean things up. There has, of course, been a prequel which introduced a new set of characters. It made sense to bring these two excellent casts together. This bringing together feels slightly clunky at times. It is as if we are watching two separate X-MEN universes at first. Singer goes out-school TERMINATOR on us, starting with an inevitable war in the not-too-distant future. Through use of time travel, Wolverine (Hugh Jackman) is sent back to stop an assassination attempt which leads directly to the war. This film teams up Wolverine and Beast (Nicholas Hoult) as the fighting X-Men. They work on getting a demoralized Charles Xavier (James McAvoy) to rekindle his passion for aiding fellow mutants. They must also try to activate the morally loose Magneto (Michael Fassbender) to work alongside them in an effort to stop their fellow friend Mystique (Jennifer Lawrence) from carrying out her assassination plot. Wolverine is aided with little more than the knowledge that they MUST work together and the fact that Charles and Magneto had put aside their differences in the future (when they are played by Patrick Stewart and Ian McKellan). There are some wonderful action set pieces in this film. The opening sequence, half-filled with previously unseen mutants, is a perfect example of the team working as a unit. Even as they are killed off, it is the kind of team based fighting against a common enemy that the third X-MEN film couldn’t be bothered to work towards, other than having Colossus throw Wolverine a couple of times. Movies are a show-don’t-tell medium. Where X-MEN: LAST STAND spent a ton of time talking about teamwork without giving us anything but a superficial version of it, X-MEN: DAYS OF FUTURE PAST understands that the combination of powers should be seamlessly interwoven to demonstrate that these guys have done this kind of thing before. The introduction of Quicksilver (Evan Peters) is perfect comic book storytelling. He isn’t dismissed as a side note or ignored as a minor character. His skill is needed for the job they have, so they bring him in to do it. The section of the film in which he is featured is almost his own little short within this whole movie, and it is possibly the best section of the entire movie. I’m looking forward to more of him in the further X-MEN films. A late stadium bit seems to be superfluous until it actually has a point. Magneto certainly has a flare for the dramatic, but he is also the only character who seems to consistently assess his current situation and change his entire mode of thinking in an instant. Perhaps this is born from the survivalist he had to be back in the concentration camp, but it makes his character scary and unpredictable even when he is not using his powers. He betrays friends as easily as he throws a car with a flick of the wrist. He sees his cause as more important than any individual, save for himself. Peter Dinklage being added as the villain, Dr. Bolivar Trask, is a wonderful addition. His sentinels are merely pawns in the big story, not the main event as happened in something like IRON MAN 2. The danger in this film is always on the edge. This is not a movie which feels like everything will just be okay at all times. Including the WOLVERINE films, this is a series which is now six movies in. Rather than suffering from fatigue, as it seemed to have done of late, Bryan Singer manages to revitalize the series with DAYS OF FUTURE PAST. He clears up the mistakes of the third film (even if it is not always clear HOW he did so), and sets the franchise up to move forward in a positive direction. This is, without question, the X-MEN film with the best special effects. They get a bonus point here for being so good. ~ by johnlink00 on June 4, 2014. Nice review John. Reminded me why this franchise was so lovely to watch in the first place. Let’s hope it stays that way, too. Thanks man. It was definitely a return to what the X-Men should and can be. Thanks! I absolutely agree that there is room for improvement. But I’m glad to see the upswing form the first Wolverine stand-alone movie debacle is continuing. This is at least back on par with the first two Singer films, for me anyway.